In the fall of 2013, computer software designer Jason Huggins was at the top of his game, having launched two tech startups that test browser and mobile app compatibility, plus a stint with tech giant Google. That's when he got the call from the White House. It's been a couple of months since Oak Park's sole robot manufacturing business set up shop in the Oak Park Arts District, 224 Harrison St., and the best part so far – the smell of hot apple pies baking in the oven. That's according to Jason Huggins, founder of Tapster Robotics Inc., who noted that the new studio is located next door to Happy Apple Pie Shop, which, like Tapster, opened in the newly renovated building within the last few months. "We have the sweet scent of apple pie wafting through the rafters every day," he said with a laugh. Huggins, who is known for building the software package Selenium, which tests touchscreen applications, gained notoriety in 2013 for an art-project robot that played the video game Angry Birds. He took that model and created Tapster, which goes beyond the software that virtually tests touchscreen apps for bugs, and uses a robotic finger to physically tap the devices. "Literally it's a robotic finger," he said during a recent tour of the new studio. "Any company that makes a mobile device, a mobile phone – the Apples, the Samsungs, the Nokias of the world – they all have these secret robot labs of robotic fingers tapping to make sure the devices work and the applications … running on those devices work." The rise of touchscreens in automobiles and other devices – known these days as the internet of things – also is keeping business thriving at Tapster, Huggins said. Building robots that tap on tiny screens to make sure they work is just part of what Huggins and company are up to at Tapster. Huggins said he's working now to put Oak Park on the map for breaking the world record for – prepare yourself to be amazed – dancing robots. Meg Nelligan, Tapster's chief operating officer, tells Wednesday Journal that the robotics company also has been educating kids on robotics basics by teaching them to build their own dancing robots. The so-called dance-bots move their arms and heads in a way that resembles the once-popular dance known as "The Robot." That got the Tapster team thinking, Nelligan said. "The dance-bot is fun and it's a great educational tool, but we've been wondering, 'What can we do with it as a company?'" she said. "Jason got the idea of, 'Is there a world record for how many robots were dancing the robot dance?'" Huggins said he began checking with folks at the Guinness Book of World Records about a year ago. Back then there was no such record – but things change quickly in the world of technology. About a year later, the record for dancing robots all in one place – not necessarily dancing "The Robot" – has been set by a company in China and then broken by another Chinese company, Huggins said, noting that the record currently stands at 1,007. 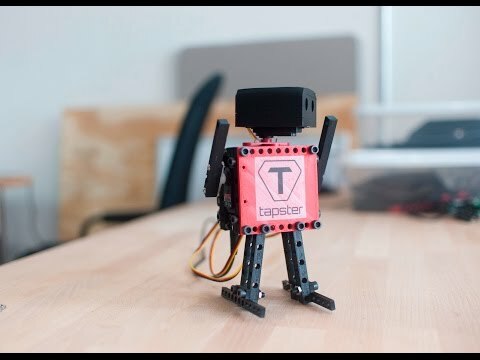 It takes only 50 dancing robots to establish the record, a number Tapster could have managed, but now that the record is more than 1,000 robots, Huggins said Tapster is "trying to figure out a way to pay for it." They're thinking of trying to pay for the project through the online fundraiser website Kickstarter, he said. Dancing robot breaking world records isn't the only imaginative pursuit at Tapster. Huggins also is working on a robotic pin art project that would automate thousands of pins to resemble the pin-art desk toys sold in gift shops. "Pin art or pin screen is the name of the desk toy," he said. "The idea is, 'What if you could motorize every single one of those pins?'" That would allow Huggins to program the screen to replicate any 3-dimensional object – think downtown Manhattan, the Grand Canyon or even a game of Asteroids – he said. He's still working on the prototype to make sure the pins are reliable and don't stick or break. "In some future version I'll have to figure out, OK now that I've made one, how do I make 10,000 of these things; that's the trick," he said. While Oak Park is not known as a hub for technology companies, Huggins said he decided to locate here, rather than Silicon Valley, largely because of the lower costs and greater amenities Oak Park and Chicago have to offer over the west coast. "I think the cost of living (in Silicon Valley), specifically real estate, is just completely out of control," he said. "There are many ways to solve (the problem of cost) but the way I solved it was by moving away." Rather than putting his money in overpriced land in the Bay Area, Huggins said he chose to invest the money in 3-D printers and equipment. "We're in a walkable neighborhood, the Buzz Café is awesome and our kids can walk to school, so everything we need is here," he said. "Yes, the winters are cold, but you put on a hat and a winter coat and you're good." Tapster, Happy Apple and a local architecture firm are the newest tenants of the building that previously was La Majada, a Mexican food restaurant that closed in April 2014. The façade of the building was redone and a gut rehab of the structure subdivided it for multiple uses. Great to have high tech in the community.